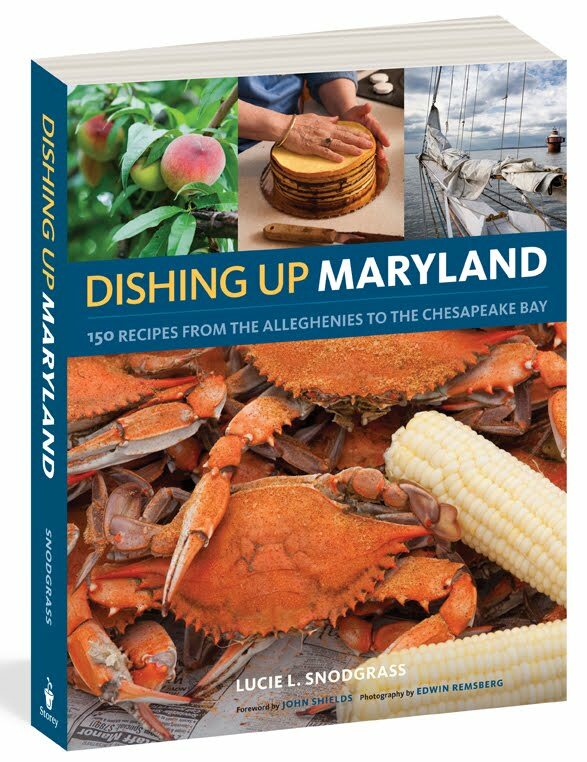 To help celebrate our wine & cheese week at Inside Storey here's a simple summer recipe for Roasted Eggplant with Goat Cheese from the pages of Dishing Up Maryland. Creamy and slightly tart, this is a wonderful appetizer for a late summer or fall harvest party, and would pair well with a nice glass of Maryland red wine, like Calvert County's Running Hare Vineyard's award-winning Malbec. 1. Preheat the oven to 400 degrees F. Cut the eggplants in half, pierce them in several spots, and put them on a parchment-lined baking sheet, flesh side up. Brush the eggplant with 1 tablespoon of the olive oil and sprinkle with the garlic and 1/4 teaspoon of the salt. Roast for 45 minutes, until the eggplant flesh is soft. 2. Scoop out the roasted eggplant flesh and discard the skins. Put the eggplant and goat cheese into a food processor and pulse for 5 seconds. Add the remaining 2 tablespoons olive oil and the salt an pulse again to combine. Sprinkle parsley over the dip and serve with vegetables, pita chips, toasted baguette rounds, or crackers. Timber Press and Workman Publishing are also celebrating wine and cheese this week on their blogs, so check them out here: Workman's Blog and Timber's Blog. And stay tuned to Storey's Blog all week long. We have Jeff Cox, author of From Vines to Wines tomorrow; Gene Spaziani, author of The Home Winemaker's Companion on Thursday; and Sue Weaver giving us the history of goat cheese on Friday.